Frances Davis Alda (31 May 1879 – 18 September 1952) was a New Zealand-born, Australian-raised operatic soprano. She achieved fame during the first three decades of the 20th century due to her outstanding singing voice, fine technique and colourful personality, as well as her frequent onstage partnerships at the New York Metropolitan Opera with Enrico Caruso. Leonore, a promising singer from a musical family, in September 1880 divorced David to resume her singing career. Fanny spent her early years traveling with her mother on her operatic tours. After false starts in Australasia, she took Fanny and her younger brother to San Francisco, California in 1883. Leonore Davis remarried but died of peritonitis in San Francisco on 29 December 1884, shortly after remarrying, to Herman Adler. After her mother's death, Alda was sent to live with her maternal grandparents, Martin and Fanny Simonsen, in Melbourne, Victoria, Australia. She sang in productions of Gilbert and Sullivan in Melbourne before leaving Australia for Europe at the age of 22 in order to undertake additional study and pursue an international singing career like her future soprano rival Nellie Melba. After receiving lessons in Paris from the renowned teacher Mathilde Marchesi, who gave her her stage name, Alda made her debut at the Opéra-Comique in 1904 in Massenet's Manon. She appeared at the Royal Opera House in Covent Garden in 1906, and at La Scala, Milan, during the 1906-08 seasons. In 1908, the former La Scala impresario Giulio Gatti-Casazza became director of the Metropolitan Opera. On 7 December 1908 Alda made her debut there. On 4 April 1910, Alda and Gatti-Casazza married. According to American Art News (New York, 19 March 1910), Adolfo Müller-Ury was painting Alda just before her marriage. It was in New York that Alda furthered her career, appearing to acclaim in such famous operas as Martha, Manon Lescaut, Otello, Faust, Mefistofele and La bohème. She began recording for the Victor Talking Machine Company in 1908 and several of her records became best-sellers. She created the title roles in Victor Herbert's Madeleine and Henry Hadley's Cleopatra's Night as well as Roxane in Walter Damrosch's Cyrano. She also sang regularly with Enrico Caruso. Alda toured Australia and New Zealand in 1927. She and Gatti-Casazza separated the following year and then divorced. In 1929, she left the Met but continued to give concerts, make radio broadcasts and appear in vaudeville. Alda's 1937 autobiography was titled Men, Women, & Tenors. On 14 April 1941 in Charleston, South Carolina, she married Manhattan, New York City advertising executive Ray Vir Den; he was a decade younger than she. She would have an affluent retirement in Long Island, and traveling. She died of a stroke (some sources cite cerebral hemorrhage) on 18 September 1952 in Venice, Italy, aged 73. "O mio babbino caro" from Giacomo Puccini's Gianni Schicchi, sung by Frances Alda in 1919. A 1913 recording of "Ancora un passo" from Giacomo Puccini's Madama Butterfly. ^ Alda amended her birth year to 1883 to make herself more appealing to operatic managers. This incorrect year is often recorded as her actual year of birth. ^ a b "Frances Alda Dies. Former Met Star. 21 Years Before Retiring in 1929. Sang 40 Roles. A Gatti-Casazza Protege. Came to U.S. With Milanese Impresario in 1908. Stricken by Brain Hemorrhage". New York Times. September 19, 1952. ^ Charlotte Macdonald (1992). The book of New Zealand women (First ed.). Wellington, NZ: Williams. ISBN 0-908912-04-8. ^ "Mme. Frances Alda Wed To Ray Vir Den. Former Opera. Singer Bride Of New York Advertising Man". New York Times. 15 April 1941. 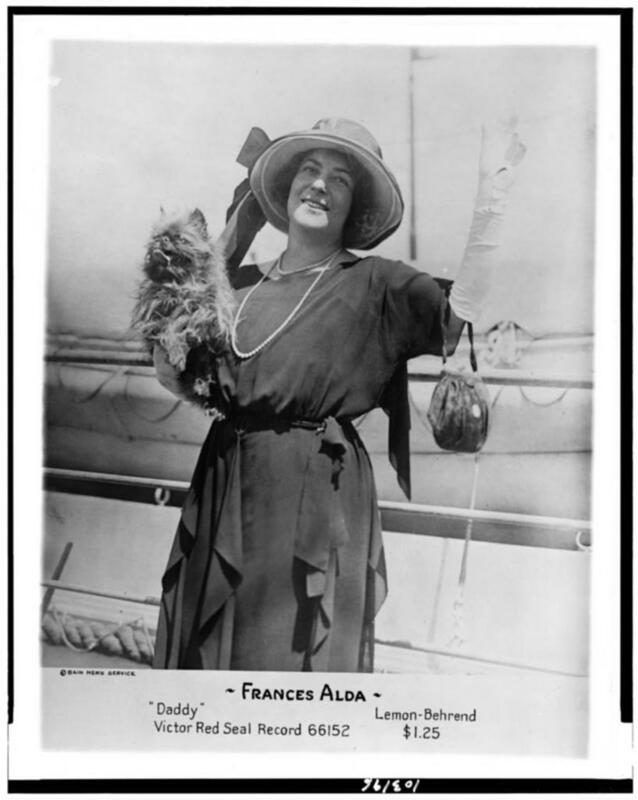 Profile of Frances Alda, "New Zealand's most famous daughter"